This seems to be simple design and called “KANOKO pattern” which is one of traditional kimono design patterns. This kimono has also simple design but you can select HAKKAKE(lining of kimono). Furthermore, you can select the color from Bokashi(gradation) and simple colored HAKKAKE, and simple colored one looks more fashionable. Bokashi hakkake gives an impression of traditional style. This is a wool red dot patten kimono. The brand, GENJI MONOGATARI is one of famous yukata brands. The last one is simple pattern with color. Isn’t it cute? How’s simple ones? Hope you will enjoy! Hi there Kimono fans in the world! top menu > About Kimono > Japanese Traditional Colors. 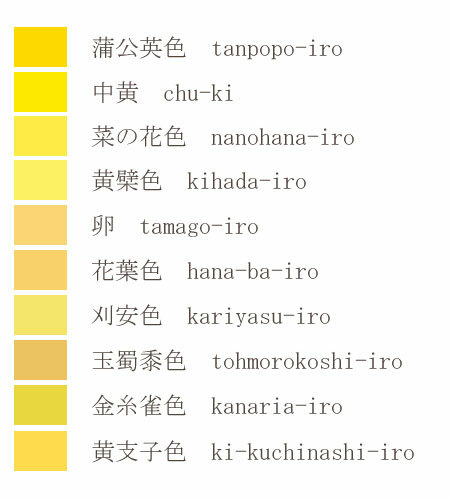 The chart shows color, Japanese kanji character, and Japanese name in Rome character. Some of those names came from nature and you will find interesting when you learn Japanese as well XD. Also those colors were born from nature, so look so tender.